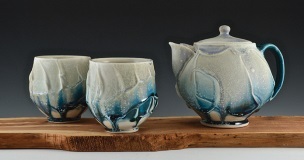 There are so many methods for decorating pottery with slip – from slip trailing to mishima. Today, I am presenting another super fun slip decorating technique that reminds me of putting icing on a cake. Chris Lively applies thick slips to his leather-hard pots and then uses various tools to sculpt and shape it – much like a pastry chef would work with icing. In this excerpt from the November/December 2016 issue of Pottery Making Illustrated, Chris explains one of his favorite ways to create this slip decoration. – Jennifer Poellot Harnetty, editor. P.S. Want to learn more about Chris Lively’s process? Read his full article (in the November/December 2016 issue of Pottery Making Illustrated) to find out how to properly mix slip for this technique as well as two other slip application techniques. Also as an added bonus, Chris describes his process for spraying glazes and you’ll even find a recipe for a mid- to high-fire lavender glaze. Who knew decorating with slip could be like icing a cake? Slip can be applied to wet or to leather-hard clay. I prefer to apply slip at the leather-hard stage, because it allows me to trim the pot without disturbing the slip. I add slip directly after trimming; if the pot is too dry, the slip will crack. If cracks form around thick to thin areas, take a pencil or rubber clay shaper and compress the cracks. This method helps prevent the cracks from opening up further when fired. 1 Scoop the slip and apply it to the spinning pot. Start at the top and cover halfway down the surface. 2 Use a chip brush and swipe up while turning the wheel counter clockwise. Each swipe will cause the slip to drip. I keep slip in a small, two-gallon bucket, which allows it to be easily stirred by hand. If you find your slip has thickened since you last used it, add a bit of water to get the right consistency and stir it again. Up-end the form and center it on the wheel before applying slip. My first method of application is to scoop the slip out with my hand and apply it to the spinning pot (1). Start at the top (which is actually the bottom) and cover the surface until about halfway down. Once slip is applied to the desired thickness (no more than 3⁄8 inch), you can begin decorating. Note: From this point on, the wheel is stopped and only moved by hand. 3 Continue swiping around the pot until you’re satisfied with the thickness of the lines and the overall design. 4 Before turning the pot over or removing it from the wheel, clear the exterior foot ring of any dripped slip. Using a chip brush and starting on the pot just below the slip, swipe up while turning the wheel counter clockwise. Each swipe will cause the slip to drip (2). Continue this all the way around the pot (3). Clean off any slip that remains on the foot (4). Leave the pot to dry for about an hour, then flip it right-side up (5). Press down or wipe away any sharp drips that are still malleable. Once the slip is dry enough, cover the pot loosely with plastic or a bucket. 5 Allow the pot to dry for about an hour, or until the thicker slip lines stiffen up, then flip it right-side up. clay, foot, high fire, leather hard, slip, slip trailing, spraying, trimming, wax resist. I really like your ideas here. Very nice and helpful for experienced potters and newbies like me – especially if we don’t quite like our current results. This provides some do-able techniques to try out. Such beautiful contrast between the crisp throwing line and ‘messy’ slip decoration. Deliberate distortion, I love it!